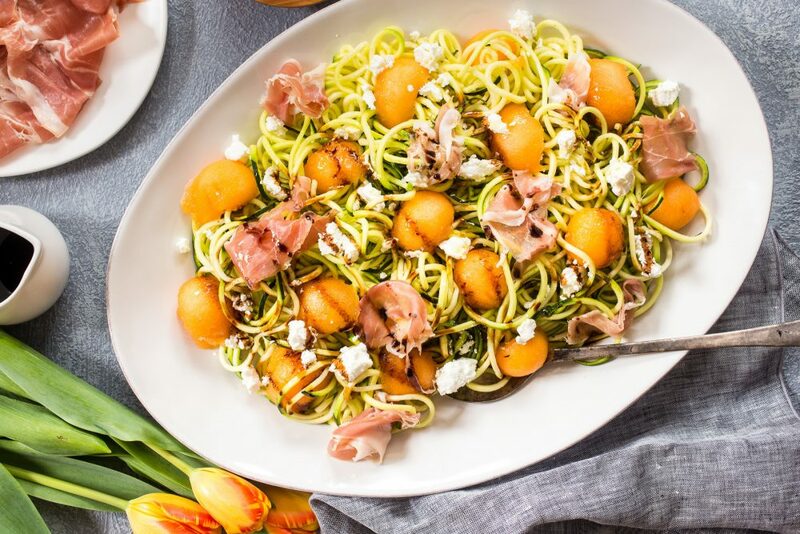 A Prosciutto and Melon Salad is as refreshing as it sounds, but adding zucchini noodles to the mix takes things to a whole new level. Make that outdoor get-together one to remember with deliciously sweet melon, creamy goat cheese and savory Prosciutto di Parma. This dish is the perfect way to use all those seasonal garden fruits and vegetables, while giving them a kick with prosciutto and cheese. Serve with a pitcher of fresh lemonade (we won’t tell if it’s a little spiked) and this Prosciutto and Melon Salad with Zucchini Noodles is all you need to get into the warm-weather spirit. This recipe was originally featured on Girl in the Little Red Kitchen as part of her Spring Garden Party.